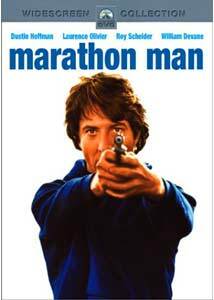 Marathon Man is one in a series of 1970s suspense/action films that became classics quite quickly after release. Of course, with a cast that includes Dustin Hoffman, Roy Scheider, and Sir Laurence Olivier, and a crew that includes John Schlesinger (of Midnight Cowboy fame), and novelist/screenwriter William Goldman (Butch Cassidy And The Sundance Kid, All The Presidents Men, The Princess Bride), how could you make a bad movie? Goldman provides the gripping plot, central to any thriller, while Schlesinger makes sure that the characters and their motivations don't get steamrolled over by the story, and the actors bring the characters to life. This movie, like Paramount's other thriller classic of the 1970s, Chinatown, is a convergence of great actors, director, and screenwriter all at the very peak of their powers, and the result is stunning. Marathon Man is a movie that hinges on its surprises in many ways, so it's quite hard to do even the most basic plot synopsis without giving things away. Suffice it to say that Dustin Hoffman plays Thomas Levy (affectionately referred to by his friends as "Babe"), a graduate student in New York who is obsessed with his father's suicide (induced by accusations leveled at him during the McCarthy era), and training to be a marathon runner (hence the title). His brother, Doc (Roy Scheider) is a spy working with Christian Szell (Sir Laurence Olivier), an ex-Nazi with millions of dollars worth of diamonds in a safe in New York. I won't say how, but Thomas, Doc, and Szell's affairs get mixed together, to the detriment of all three (and everyone else involved). The first thing about Marathon Man that impresses is its cast. Dustin Hoffman is solid as a rock as Thomas Levy (and managed to convince a movie-going public that he could be in college, despite pushing forty!). Hoffman grounds the film in an emotional reality, so that the audience is willing to go on a harrowing journey with him. Hoffman also plays on his still popular image as Benjamin Braddock from The Graduate. By coming off as a Braddock-type character, Hoffman can then pull the rug out from under us in the third act. Roy Scheider brings with him the screen presence that made him so popular in Jaws and The French Connection. Marthe Keller, already a star in Europe, made her American debut in this film, and she makes a good impression. Fritz Weaver also makes a cameo as one of Levy's college professors. And then we get to Laurence Olivier. The most celebrated actor of his generation, and probably the most acclaimed stage actor of all time, he was already a living legend by 1976. And yet, health problems beginning in the late 1960s meant that by the mid-1970s, Olivier was all but ignored, taking bit parts in unimportant movies. Robert Evans, the film's producer, decided that it was high time someone used this most famous man, and pleaded with Lloyd's of London to insure Olivier for six weeks of shooting (the final tally was eleven weeks). While Marathon Man does not have Olivier's best performance, it shows a master craftsman hungry to sink his teeth into a deserving role. And to his credit, there are times when he is so involved in the role that the audience forgets they are watching Laurence Olivier, and think they are watching Christian Szell. Considering that most truly famous actors are overshadowed by their public personas (have you seen any Jack Nicholson movie in the past ten years where you weren't aware at all times that you were watching Jack Nicholson? ), what Olivier pulls off here is a powerful achievement. The effectiveness of the "dentistry" scene is due entirely to Olivier's handling of the material: he plays the scene as if he were a gardener delicately trimming a beloved tree. Without a good script, the talents of such fine actors would be wasted. Luckily, Marathon Man had one of the best screenwriters in the business, William Goldman, who adapted the film from his own novel (as he would later do with The Princess Bride). The adaptation shows that Goldman is not just a good novelist and screenwriter, but also a master at moving from one medium to the other (a skill that some novelists and screenwriters have an acute problem with). The plot is as good as thrillers get, and also contains such good characters and believable dialogue that it draws you in and makes you care about the people you're watching. While in a couple of scenes we have to wonder at some of the character's motivations (especially during a critical scene between Scheider and Olivier), for the most part the script is strong. And the final component that brings it all together is director John Schlesinger. Acclaimed for such films as Midnight Cowboy and Billy Liar, among others, Schlesinger decided to do this movie because he had never before made a thriller. The mix of Schlesinger's character-driven sensibilities added to a plot-driven genre creates a thriller with a surprising amount of depth. In fact, the first hour is really character development, which is a surprisingly bold and daring move. This sometimes means that the first hour feels slow, but then the second hour becomes such an adrenaline rush that it makes the whole first hour come into perspective. Not only is Schlesinger developing the characters, but he's creating a rhythm that the audience falls into, which is subsequently broken. Image Transfer Review: The transfer on this disc is less than stunning. While it is anamorphically enhanced, it looks terrible. The colors are muted to the point of dullness (I assume Schlesinger meant for the colors to be muted, but I think this transfer suffers from age as well as director's intentions), and at times look murky, which make it hard to identify small details. Also, some darker scenes are so dark that you can't tell what is going on - at all. That is not a good sign. On the plus side, there is no artifacting in evidence, and absolutely no grain, nicks, or scratches whatsoever. Audio Transfer Review: Marathon Man has perhaps the most stifled and conservative 5.1 mix that I've ever heard. Almost all of the action is more or less focused in the center speaker, with the front surrounds getting a little action. The rear speakers were only used to split the dialogue around the room. While there are action sequences in this movie, there aren't too many big explosions or anything, so I can forgive what seemed to be a pretty weak deep end. Also, some of the dialogue stems betrayed their age. Meanwhile, purists and completists will be happy to note the inclusion of a restored mono track, which doesn't sound all that different from the 5.1 mix, sadly. A French mono track is also provided. Extras Review: Not an advertised special edition, this disc still packs some great extras. The best are two documentaries, Going The Distance: Remembering Marathon Man and the absurdly titled The Magic of Hollywood - Is The Magic of People. Going The Distance was created for this DVD, and it contains new interviews with Dustin Hoffman, Roy Scheider, Marthe Keller, William Goldman, and producer Robert Evans. I really enjoyed this documentary; it was in-depth and I learned quite a lot about the making of the film. The Magic of Hollywood was made back in 1976, and for what should be a studio fluff piece, it's almost as illuminating as the newer one. It contains interviews with Hoffman, Scheider, Keller, Schlesinger, and is narrated by Evans. The best part about this documentary is behind-the-scenes footage with Laurence Olivier, including a farewell party that the cast threw for him. After those documentaries, you can go and look at rehearsal footage, including a scene between Hoffman and Scheider that fleshes out their relationship far better than any scene in the movie did, as well as a rehearsal of the dinner scene with Scheider, Keller, and Hoffman that is laughably bad. Between each take is a snippet of explanation from one of the actors involved. Rounding out the extras is a theatrical trailer. Not a bad haul. Add together the talents of Dustin Hoffman, Roy Scheider, John Schlesinger, William Goldman, and Laurence Olivier, and what do you get? Only one of the most potent and enthralling thrillers of the 1970s or any decade. With an unparalled cast of actors, inspired and intelligent screenplay, and director who plays with the conventions of the thriller genre, Marathon Man is an excellent movie and a necessary addition to a film buff's collection.